Thankfully there are 15 days to celebrate the Chinese New Year. 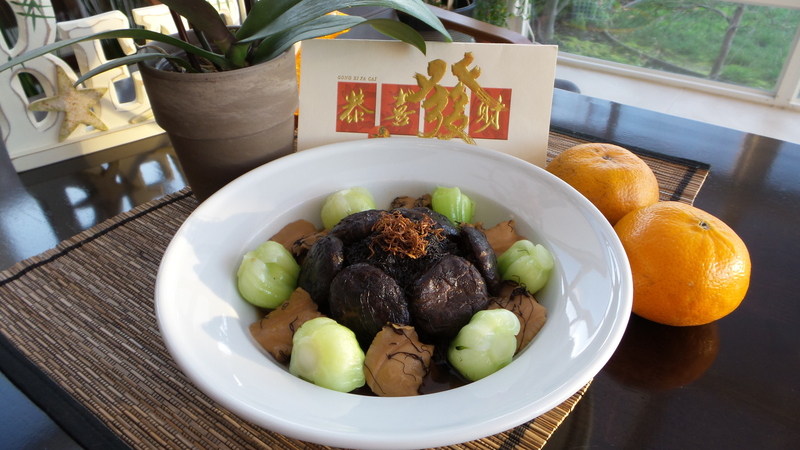 I still have some time to catch up with the blog posts on Chinese New Year dishes :). ‘Fa Cai’ a.k.a. 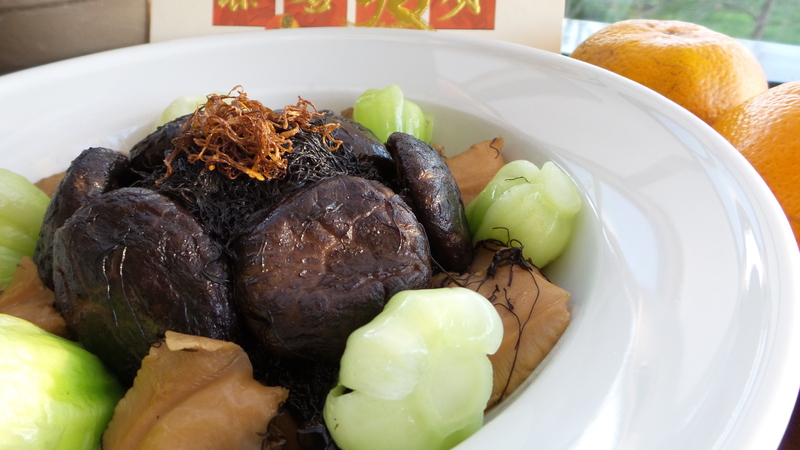 Black Moss (发菜), a homonym for fortune (发财）in Mandarin, symbolizes ushering in good fortune in the Chinese New Year. Gong Xi Fa Cai (恭喜发财)! Soak dried mushrooms in 2 1/2 cups of water till the mushrooms are softened. Squeeze the mushrooms to remove water, DO NOT discard the water used to soak the mushroom. Remove mushroom stems. Run the mushroom-flavored water through a fine sieve into a medium sauce pan. Simmer with the mushroom stems for 20 minutes. Discard the mushroom stems. Set mushroom stock aside. Soak black moss in cold water with a tsp of canola oil until softened. Drain and squeeze dry. Set aside. Boil baby bok choy for a few minutes until softened, and arrange them on the serving dish. Heat oil in wok over medium-high heat. Add the galangal, old ginger, and young ginger, and fry for a few minutes until fragrant. Add softened mushrooms, and stir fry for a few minutes until the mushrooms start to brown. Add oyster sauce, dark soy sauce, light soy sauce, and brown sugar to the mushrooms, and continue to fry for a few minutes. Add the mushroom stock, bring to a boil over high heat. Reduce to low heat. Simmer the mushrooms, covered, for an hour. Add the oyster clams and black moss, bring to a boil again, and simmer for 5 more minutes. Do not overcook the black moss. Transfer the black moss to the middle of the serving dish. Arrange the mushrooms and oyster clams around the black moss. Ladle sauce over the black moss. Serve hot.